Yesterday’s release of macOS Sierra has given us the first look at the new MacBook Pro sporting the long-rumored Magic Toolbar. The image, which is buried within the file structure of macOS Sierra 10.12.1 release, relates directly to the Touch ID functionality embedded within the function-row-replacing strip. The images, which were also noted by a MacRumors tipster, are found within the System/Library/PrivateFrameworks directory of macOS Sierra 10.12.1. The leak relates directly to using Apple Pay via the Touch ID sensor embedded next to the OLED Magic Toolbar. As you can see from the image below, the Magic Toolbar is dynamic, allowing it to display contextual content on its display depending on the task at hand. In this case, the toolbar features an Apple Pay interface with instructions for fulfilling a transaction via Apple’s online store. In addition to confirming the existence of the Magic Toolbar and Touch ID support, we can glean some additional tidbits from the leak. That is, of course, assuming that these mockups represent the final version of the MacBook Pro that will be announced on Thursday. For starters, it’s clear that the new MacBook Pro will have thinner speakers that take up the whole left and right side of the unit where the keys meet. The current generation 13″ MacBook Pro doesn’t feature speakers adjacent to the keyboard, so this is leak is probably the 15″ model, unless Apple was able to squeeze them in on its new 13″ MacBook Pro. It’s also clear that the updated keyboard features the new arrow key layout from the current 12″ Retina MacBook. That, and the ESC key has been completely removed in favor of the OLED Magic Toolbar. Keys also appear to be wider, although it’s hard to confirm whether or not this is the case without going hands-on with measurements. 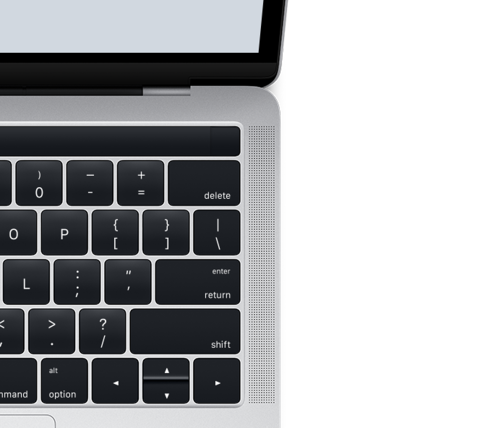 The keys, at least in these initial leaks, look awfully similar to the keys featured on the Retina MacBook. Those keys, which adopted Apple’s new butterfly mechanism, are polarizing within the Apple community to say the least. Apple is expected to unveil new 13″ and 15″ MacBook Pros, along with a 13″ version of what will presumably be an updated MacBook Air. Stay tuned to 9to5Mac for more details.